Deep within the bowels of New York City. 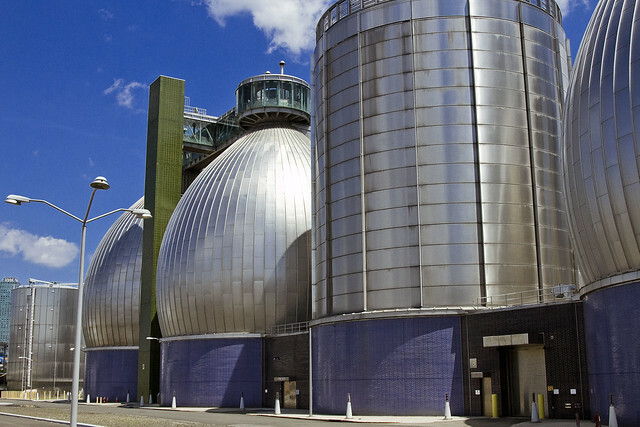 As mentioned yesterday, I was asked to speak at a Waterfront Alliance meeting which was scheduled to occur last week in Greenpoint at the Newtown Creek Wastewater Treatment Plant, and the DEP folks who manage the plant offered to bring the WA group through the facility for a tour. Of course, I’ve been through here several times, and due to my various committees and general obsession with Newtown Creek, the sewer plant is kind of a familiar place to me – but you never say no when City employees open a locked door and invite you in somewhere to take a look around. We actually got to go to a section of the plant which I’ve seldom seen, which is the generator and electrical room. 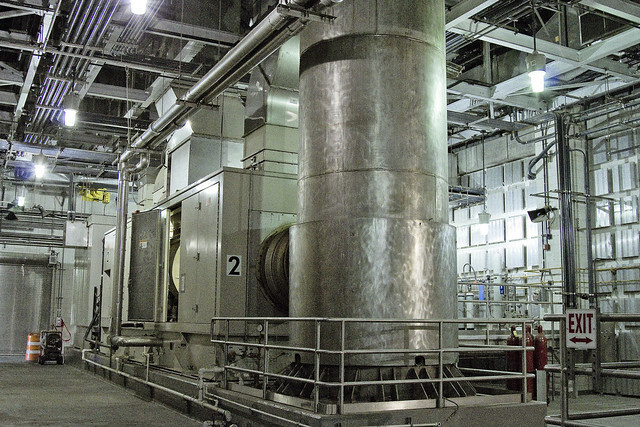 Normally the plant consumes power from off the CON ED electrical grid, but during power outages and high usage periods the DEP can flip the switches that power up the plants own power turbines and fend for themselves. The DEP engineer conducting the tour explained that these turbines are functionally jet engines whose thrust drives the generators. There was some routine maintenance going on and we got to see what the equipment actually looks like, which was a first for me. 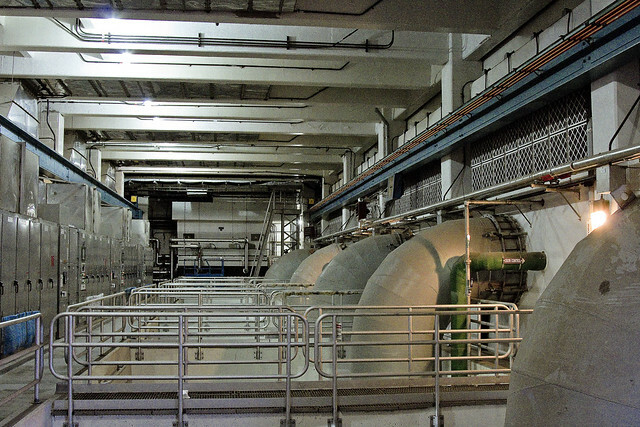 Of particular interest are the pumps and enormous pipes through which the waste water enters into the plant, pictured above. On a dry weather day, these pipes carry around 310 million gallons of the stuff. The day we were visiting with the DEP followed a terrific thunderstorm that had just rolled through the night before, and the DEP folks said that they had processed an astounding 800 million gallons of water at the plant. 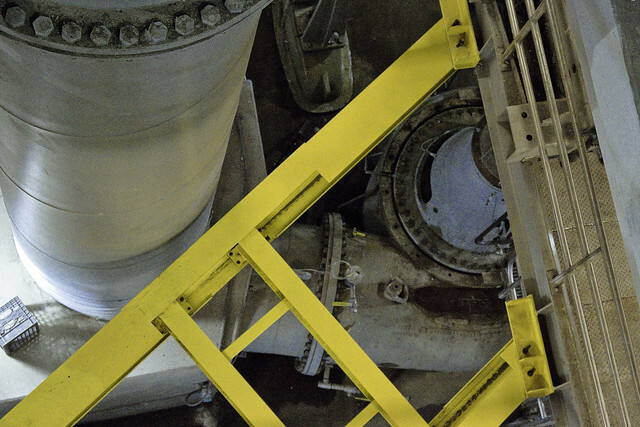 The shot above looks down around two to three stories from a catwalk, and the gizmo framed by the yellow steel is one of the actual sewage pumps. DEP has had some issues with these pumps, supposedly a factory defect, and they are being repaired/replaced by the manufacturer. A misplaced sensor inside the pipe was forming a turbulence in the flow to form which caused the pumps to cavitate. 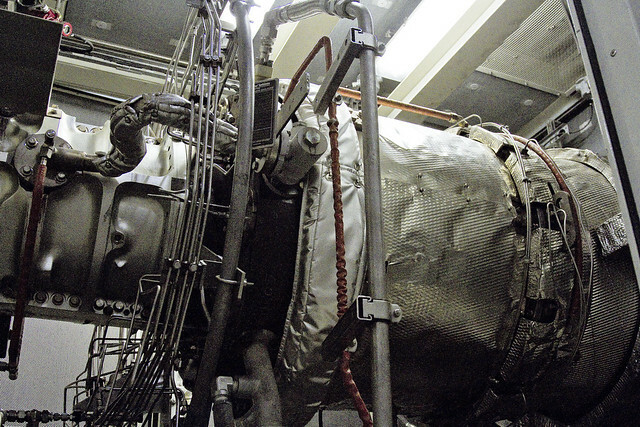 The cavitation, which is the sort of motion that a washing machine on spin cycle creates, was causing fastenings to work themselves loose and creating general mechanical havoc for the engineers. 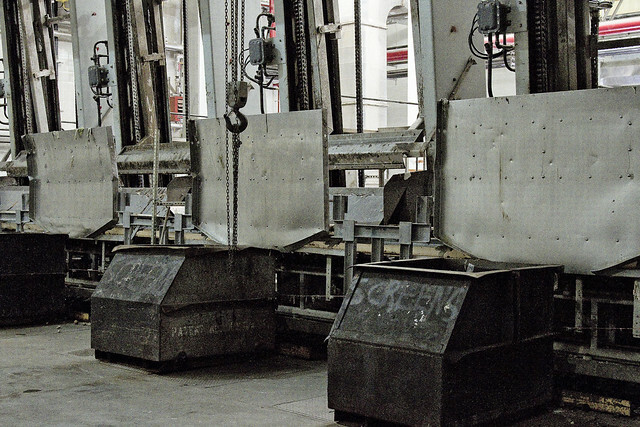 This is the screen room, where mechanical claws pull solid materials out of the wastewater flow. The smell in this area of the plant is unique – distinct from the smell of sewage, I would mention. Sewer solids smell like… the best analogy I can offer for the smell is to suggest what it tastes like when you lick the terminals of a 9 volt battery – metallic, bitter, and shocking.